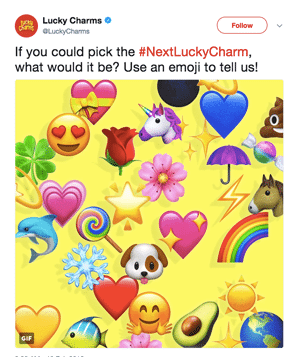 Lucky Charms ran a contest on Twitter using the hashtag #NextLuckyCharm to let consumers choose the next Lucky Charm marshmallow. Players voted by selecting from dozens of emojis that ranged from hearts to avocados to umbrellas. The winner? A magical unicorn with a flowing purple mane and purple nose. This is the first time in 10 years that General Mills has added a new marshmallow to its Lucky Charms cereal. The unicorn, however, is knocking out a fellow marshmallow, the hourglass, which has been a staple in the lineup of charms for more than a decade. Lucky Charms’ marshmallow blend features eight lucky charms including hearts, stars, horseshoes, clovers, blue moons, rainbows, red balloons and now the magical unicorns.